Handcrafted creamy, long-lasting soap with 100% Australian grown, extra virgin olive oil to condition the skin whilst gently cleansing. 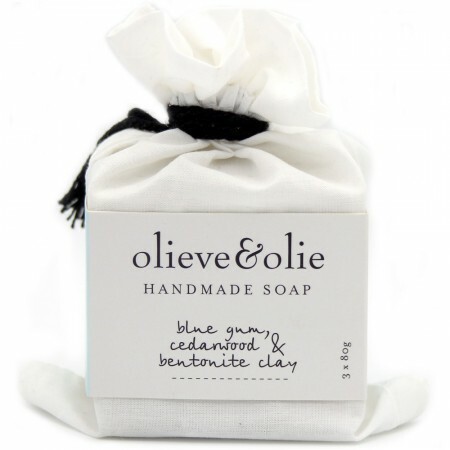 A blend of blue gum, cedarwood and bentonite clay. Suitable for all skin types. Includes 3 x 80g soap bars. This handmade, creamy, long-lasting soap with 100% extra virgin olive oil conditions the skin whilst gently cleansing. Please note: image is a guide only, the soap variety you will receive is as described. The Gunbower Creek Olive Grove was established in 2000 overlooking the Gunbower Creek, West of Echuca in Victoria. Using their very own Extra Virgin olive oil, this charming small company makes their Olieve skin care range on site. This picturesque wetland area is a haven for flora and fauna, with over 170 species of birds and the second largest River Redgum forest in Victoria. These giant Redgums and native wattles provide the grove with an ideal eco system. The olive trees have no pests or diseases and no chemicals are used. The climate provides similar growing conditions to the Mediterranean. Very special, unique products to gift to yourself or others. The main ingredient of extra virgin olive oil holds moisture close to the skin and forms a breathable film to prevent moisture loss. Cleanses all skin types effectively without drying (even sensitive skin). Sodium Olivate (Olive Oil Soap), Sodium Cocoate (Coconut Oil Soap), Sodium Lactate, Cera Alba (beeswax), Eucalyptus Globulus (blue Gum) Leaf Oil, Cedrus Atlantica (Cedarwood) Oil, Bentonite Clay, Lilite (Cambrian Blue) Clay. See the rest of our Olieve natural olive oil skin care range. This soap is lovely to use (particularly in the Redecker exfoliating soap sack). Love the salty smell with Aus bush scents as well.